Tonight’s the Christmas’ Eve in Australia. I’d like to take this opportunity to thank you all my readers. Your encouraging, lovely words and frequent visits are the energy to keep this blog going. Wish you all a Merry Christmas and enjoy happy holidays! This is the last post before Christmas. I baked this Panettone, originated from Italy that is now widely spread around the world, usually baked for Christmas day. 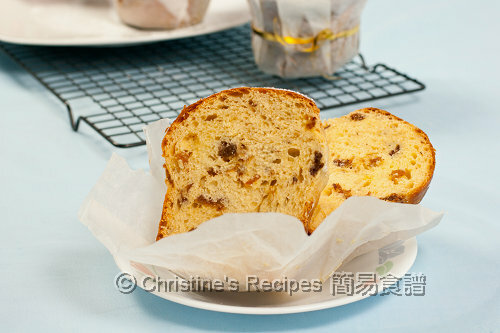 Traditionally, Panettone is baked in tins lined with baking paper, with a rustic look. After cooling down, you can keep it in an airtight container or wrapped in a plastic bag. It tastes even better after 3 days. 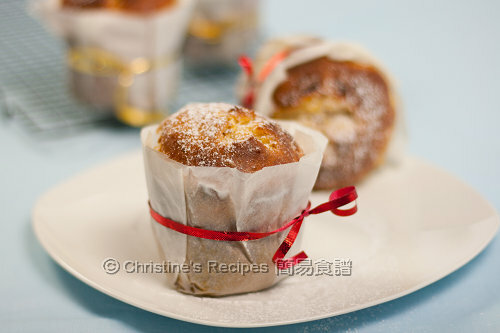 I grabbed the ramekins that already sit in my kitchen cabinet and baked these lovely mini sized Panettone. Amongst all my favourite homemade breads, this is an exceptional one specially made for a special occasion. The texture of Panettone is as soft as the tangzhong breads, with lots of fruits inside, to entertain the ones who have a sweet tooth. Christmas is a good season and reason to eat more, might be more sweet treats. Yet, I don’t like to give my family a heavy dose of sugar in their diet anyway. I chose to follow Yvonne’s recipe, tweaked with less sugar and less fat. During this festive season, I’d definitely bake more than usual, but still, try to keep some Chinese dishes served on our dinner table as well. Mix raisins with rum. Cover and leave it at room temperature overnight, or until the rum is well absorbed. Line baking paper in ramekins, with edges higher than the rims of ramekins for about 3cm. 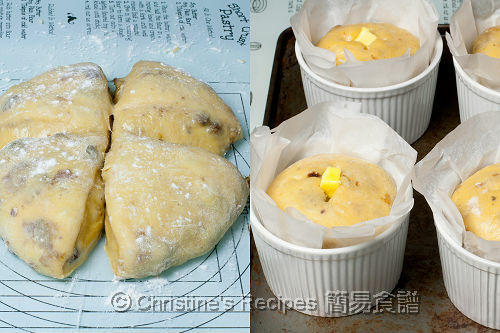 Use a stand mixer, add in dry ingredients (except raisins), followed by wet ingredients. Use the hook to beat until all ingredients come together and glutens formed. Add in softened butter, continue to knead until elastic. Add raisins, decrease to slow speed, until well combine. Roll dough into ball shape. Place in a greased bowl, covered, let it proof for about 80minutes（temperature 28C, humidity 75%）. Transfer dough onto a floured surface. Cut into 4 equal portions. Roll and shape in balls. Cover with cling film. Let rest for 10 minutes. Roll each portion in balls again. Transfer into lined ramekins. Cover with cling film and let proof until reach the rim of ramekins. Use a pair of scissors to cut a cross shape on top. Place one dice of 1cm sized butter in each cross. Bake in a pre-heated 180C (356F) oven for 40 minutes. (Note: The original recipe instructs to place in an oven with upper heater at 160C, lower at 180C and bake for 30 minutes. My oven doesn’t have different temperature control design. So I placed the ramekins at the lowest rack in my oven, closest to the bottom heater.) Test the breads if they are cooked, with a skewer/needle comes out clean. Remove from oven and let cool on wire rack. Sprinkle icing sugar on top for garnish. Enjoy with a cup of tea/coffee! The dough is quite wet and sticky, it might be challenging to knead by hand. Use a stand mixer or breadmaker to make life easier. As I use ramekins, the bottom is quite thick. I placed them at the lowest rack in my oven to help bake the bottom thoroughly. If the colour of the surface gets brown too quickly, cover with a foil to avoid burning. Or decrease the temperature and bake longer time in order to get your bread cooked through. The cubes of butter in the cross on top will help the bread expand nicely while baking. That looks like a real store bought panettone! Thanks for the beautiful pictures and detailed instructions. Made some last years...so I know these taste as great as they look! How clever! MIni ones look so cute. You are becoming quite the bread expert. These are so gorgeous, and festive looking. Merry Christmas and Happy Holidays! Love these mini panetonne! Perfect size. Merry Christmas & Happy New Year to you and your family, Christine! i also made a posting on panettones today .merry christmas to you! Happy Holidays, Christine! I love baking stuff with yoghurt. 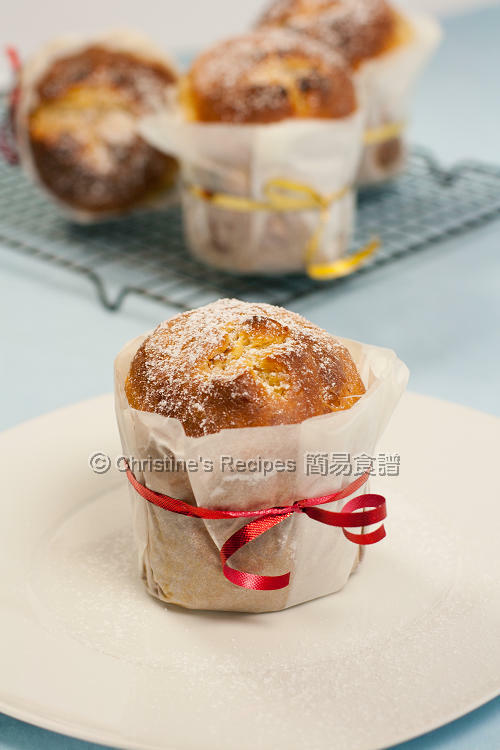 Christine, the xmas panettone looks so good. Merry Christmas and Happy New Year to you and your family! Hi! Those panettones look so cute and christmasy...Merry Christmas! Oh..those mini panettones look so good for Christmas party. Merry Christmas and Happy Holidays to you and your family! !